Mangaluru, Jan 31, 2018: Acting on a tip-off, officers of the Directorate of Revenue Intelligence, Regional Unit, Mangaluru, arrested a passenger by name Ahamed Nabeel Gaffoor (21) hailing from Kasargod who arrived by the Spicejet flight from Dubai on January 30, Tuesday evening for trying to smuggle gold pieces hidden inside a mobile phone cover in his pocket. On checking it was found that 7 tola bars of gold of foreign origin(intact) and 4 tola bars of gold of foreign origin cut into 8 pieces(totally 15 pieces) were cleverly concealed inside the mobile phone cover(pouch) by using black/silver adhesive tapes in order to avoid detection. 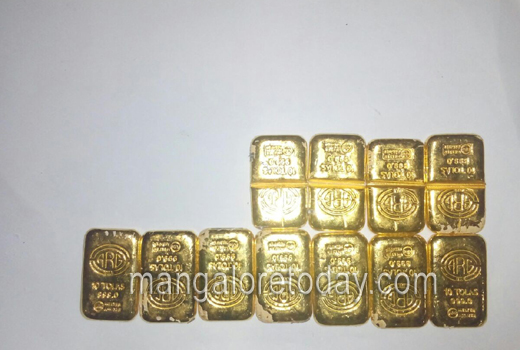 The gold pieces weighed 1282 grams in total and were found to be of 24 Karat purity and their current market value was placed at around 39 lakhs. The contraband gold was later seized by the officers of DRI under the provisions of the Customs Act, 1962.